It’s natural for parents to want to care for and protect their baby. ATTITUDE Fabric Softener Citrus Zest offers a safe alternative that is free of cancer-causing contaminants. 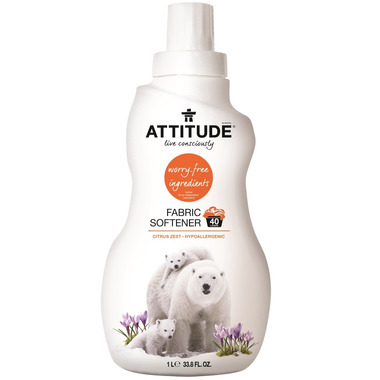 Making clothes static-free and huggably soft, ATTITUDE Fabric Softener Citrus Zest is the best choice for moms and dads. The smell is soft and divine. Citrus without the harsh chemicals. So happy I found this product! Another great option if you're looking for a safer, environmentally friendly fabric softener. Great smell and you don't need to use a lot. Love the smell and the fact that it's free of harsh chemicals. I think it is great that the product does not contain harmful chemicals; however, I the product did not make cloths etc. static free. So this only gets three stars. Steep price, but works well, smells good.